VONDOM FAZ. 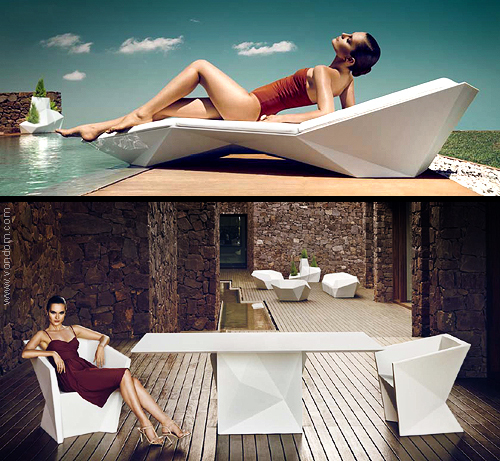 Outdoor furniture collection. FAZ is a modular outdoor collection composed by a sun lounge with an auxiliary table, armchairs, modular sofa, tables, lamp and three flowerpots of different proportions that form a unit. The double walled furniture is rotationally moulded from polyethylene resin, 100% recyclable, and highly resistant to sunlight (Factor UV8), rain and extreme temperatures (-60ºC to +80ºC). This material offers an excellent durability for both interiors and outdoor spaces. Surface finishes are available in Basic (matt) and Foc (glossy lacquered) combined with a great variety of colours. The collection is also available with quality nautical or polyester cushion. Materials: lineal polyethylene LLDPE, HPL (High pressure laminate), steel. Time will tell the way the sodium atmosphere lines the furniture, however, our experience here was superb. Shipping had been on time and simple….. Outdoor furniture requirements are usually imperfect in a domestic but this does not mean that you should compromise on its purchase and maintenance. Outdoor furniture reflects the mood and aura of the indoor environment of the house.